The Verbal Reasoning is one of the three sections of the Graduate Record Examination, the other two being, Quantitative Reasoning, and Analytical Writing Assessment. identifying relationships between two or more given sentences or words. The usage of proper grammar, tenses, verbs, prepositions, sentence construction, reading comprehension, and every other aspect that can assess the candidate’s competence in the English language is tested in this section. The GRE Verbal section comprises questions with varying formats as well as difficulty levels. Students have a total of 60 minutes to attempt the verbal reasoning questions, just like the other sections of the GRE. So what are the three major types of questions on this section? That's just what we're about to explain! Text Completion: This type of question requires the candidate to fill up single/multiple blanks in a given sentence or a paragraph with the most appropriate words out of the given choices. While this sounds simple enough, the GRE requires one to build a considerable vocabulary as well as contextual understanding capabilities in order to face such questions. Humans too, like all (i) ______________creatures who bond together, such asthe crows and bees, have their (ii)_____________. Sometimes the pettydifferences end up fatally. The blank will have a term that describes the kind of creatures crows, bees,and humans are. creatures that bond, such as the crows and bees, humans too have . . . :Humans bond with each other just as other creatures such as crows andbees that have a close bonding with members of their species. This clueindicates that some kind of social bonding takes place between membersof these species. 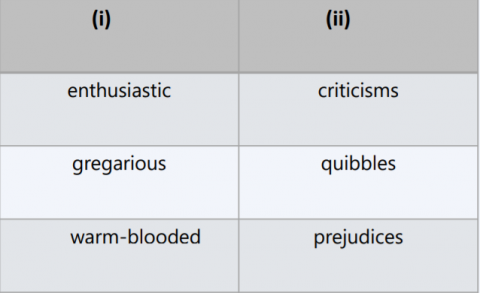 This leads to B, gregarious, for (i), which means beingsociable. Sometimes petty differences end up in fatal loss: This clue indicates thatthough the bonding is pretty strong, sometimes they also quarrel amongeach other. These quarrels, however petty, can sometimes lead to loss oflife. This leads to E, quibbles, for (ii), which means arguments. Sentence Equivalence: A variation of text completion questions, these questions throw the candidate a unique challenge - requiring him/her to identify two sentences which are most closely related in their meaning. 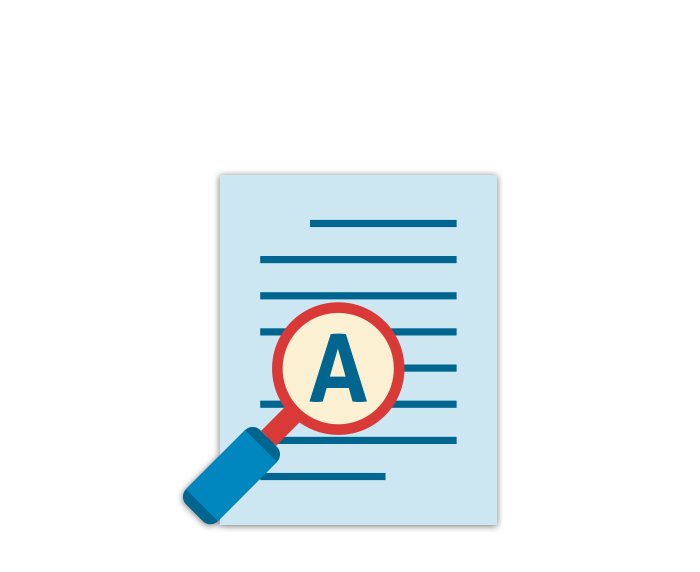 Starting from identifying synonyms from the given choices to choosing the best-fit meaning of a given sentence or paragraph, these type of questions help in assessing the candidate’s analytical skills. Joe’s fall ________ him from indulging in any outdoor activity,though skiing and trekking are his favorites. There is a contrast indicated by the word,“though.” So you know that his fall does notallow him to take part in outdoor activities.So you choose options B, prevented and C,did not permit. Reading Comprehension: The reading comprehension tests the candidate’s ability to read passages of lengths varying between 100 and 450 words, and thereafter, answer questions, identify alternatives or draw meaningful conclusions from sentences or the passage on a whole. The passages are drawn from a variety of fields including literature, technology, science or general statements. This section consists of 3 sub-types of questions which we will discuss moving forward. The United States is commonly referred to as a melting pot, a society inwhich people from different societies blend together into a single mass.Some sociologists prefer the term, “multicultural,” pointing out that even ifa group has lived in this country for many generations, they probably stillretain some of their original heritage. The term, “multiculturalism,”recognizes the original heritages of millions of Americans, noting thatAmericans who are originally from other societies do not necessarily haveto lose their individual markers by melting into the mainstream. Which of the following is true with regard to the concept of “meltingpot” as mentioned in the passage? E. The concept of melting pot is all about diffusion rather than simpleunification of cultures. The first line states that the term melting pot refers to a societythat includes people from different societies blended togetherinto a single mass. To differentiate from this idea, sociologistscoined the term, multicultural, which means that these people donot necessarily blend into a single mass, but still retain some oftheir original heritage (even if they live in the place for a longtime). So option B, The term “melting pot” refers to the culmination ofdifferent cultures into one single blended culture wherein each ofthese cultures do not retain any of their original heritages, is truewith regard to the concept of melting pot as described in the passage. Want to take a look at some sample GRE Verbal questions and find out how they're solved? Download the exclusive GREedge guide to doing just that, now! Just like the quantitative section, the GRE verbal section score is reported between a scale of 130-170 in 1-point increments. While 130 is considered to be a poor and lowest possible score, 170 is the highest score that can be recorded by a GRE taker. Questions are marked either correct or incorrect. There is no partial marking system in GRE. One of the key things to keep in mind is that universities take into consideration the percentile score and not the percentage for graduate admissions. Percentile scores report what percentage of people have scored below the recorded percentile. For example, a 90 percentile score means that you have scored higher than 90 percent of the test takers and have placed yourself in the top 10 percent. Likewise, a 30 percentile score indicates that you have scored higher than only 30 percent of the total test takers and 70 percent of the test takers have scored more than you. Basically, a good percentile score indicates an impressive performance in the test. 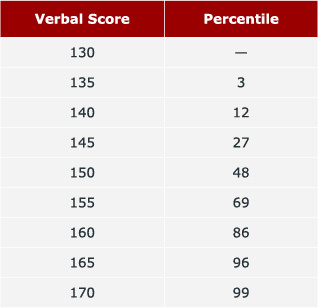 The table below shows the current rundown of GRE Verbal percentiles. Now that you have an understanding of what constitutes the GRE Verbal section and the general scoring pattern, you must be wondering what your target score should be. By rule of thumb, there is no score that can be designated as a good score or a bad score as each university has its own admission criteria and score cutoff. Therefore, your target score depends on the university you seek admission to. While any score above 160 is considered an ideal GRE Verbal score, a 150+ score is also competitive enough to for your application to be considered for admission at renowned universities. However, scores below 145 are considered as below-average or poor and may hinder one's chances of a desirable admit. 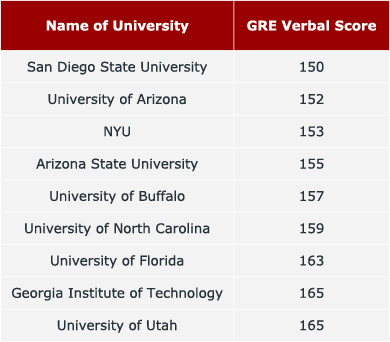 Take a look at a list of universities accepting a 150+ score in GRE Verbal below. So, a general target score for every test taker completely depends on the universities they wish to apply to. A score of 160 and above is undoubtedly considered impressive and will open wider avenues with regard to university and course choices. However, the trend of accepted scores vary every year depending on the composition of the GRE aspirants. Based on this number, the average score cutoff for each university is either increased or decreased. Therefore, it is recommended that you take into consideration the average accepted scores from the last few years and estimate a probable score cutoff for the current year, to effectively set your own target score. Get started today for a High GRE Verbal score today!